If the last time we spoke of Mar de Frades It was the former model Laura Ponte, soul space Luby & Lemerald who designed the bottle for the limited edition of exclusive more sparkling albarino from Rias Baixas, is his friend and favorite Designer (besides neighbor of atelier) Miguel Palacio, responsible for giving life to the last vintage. Less than a month that our most international gateway MBFWMadrid opens its doors, and before entering the effervescence that floods the ateliers with the closeness of Cibeles, Miguel gives the finishing touches to the cobalt-blue bottle. This Edition, which will be released next fall, saved inside the new vintage Mar de Frades 2012, which this year celebrates its 25th anniversary. Mar de Frades by Miguel Palacio gets to fashion the wine from the estuaries of Arosa, fruit of the vineyards of farm Valiñas, whose lands are bathed by the Atlantic breeze, which gives a very characteristic salt touch to your grape. 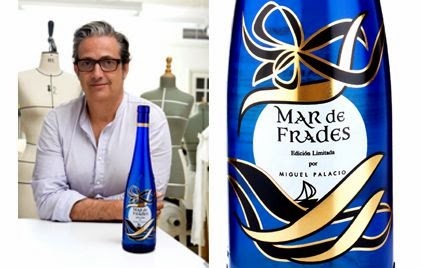 Hoping to see the new bottle that Miguel Palacio has designed for Mar de Frades, Let’s uncork another, well cool for lunch on this day of summer.